to view more information page for the products listed below. 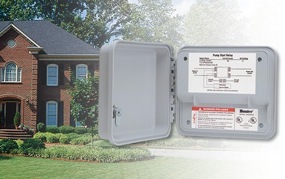 Whether you require the use of a booster pump or pull water directly from a creek or pond, it is imperative that your irrigation system includes a relay that can be counted upon to activate your pump each and every time. The Pump Start Relays have been created to provide that reliability – as well as a lockable NEMA rated enclosure – at an economical price. Available in a choice of three models to accommodate a variety of power sources and landscape needs, the product is fully compatible with all standard 24VAC controllers. It’s also designed with user-friendliness in mind, with flying leads that allow for effortless 24 volt connections plus a wide array of “knockouts” on the cabinet to make wiring easy, whatever your particular mounting considerations. DIY Irrigation - This store is powered by ShopSite web catalog software.